Does the game box look familiar? 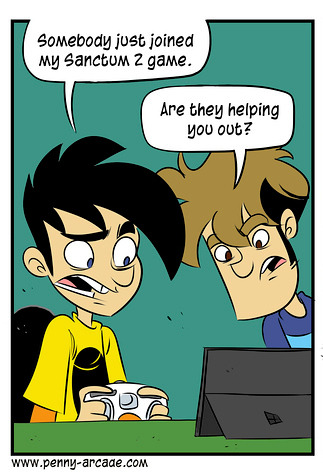 Penny Arcade web comic artist Mike Krahulik (Gabe, @CWGabriel) has already done some great pr for the Surface Pro, but this morning he was at it again--while dissing Microsoft's latest toy, the XBox One. (The Surface Pro is) also my mobile drawing studio. It runs Manga Studio beautifully, and with the latest Wacom drivers Photoshop finally supports the pressure sensitivity although i still prefer drawing in Manga Studio or Sketchbook Pro. I’ve drawn comic strips on it while on airplanes, sitting on my deck, on stage at PAX and on the couch watching TV. No question, it is the perfect mobile digital drawing hardware. Couldn't agree more. Check out the full post here.